Red Pomegranate creates artful tableware, decor items and beach accessories that are functional and made by hand. Our goal is to bring you artful pieces that can be cherished for years to come. We always pay attention to the latest trends and bring you quality products with aesthetic fashion look. 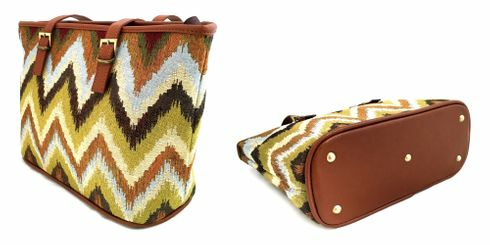 Red Pomegranate brings you an exclusive selection of "Kilim Bags" designed in fashion colors. Kilim patterns are replicated and reanimated on the outdoor resistant custom woven tapestry fabrics and hand sewn using ultra soft vegan leather to create fashion bags. The black satin-lined interior compartment with top zip closure features a center pouch and a zip compartment on the inside back wall for keeping your necessities organized. With a long shoulder strap, you can carry this tote bag as you feel the most comfortable on hand or on your shoulder. Copyright 2006-2019 Red Pomegranate. All rights reserved.